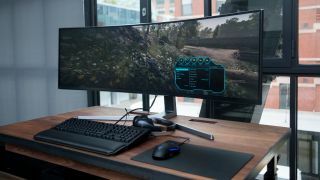 We are seeing an increasing number of huge ultra-wide monitors hitting the market these days, and apparently Samsung has another model waiting in the wings – a massive 49-inch curved screen with a resolution of 5,120 x 1,440 pixels. As TFT Central reports, this new monitor – which Samsung will purportedly begin to manufacture in September – very much builds on the Samsung CHG90, the behemoth 32:9 aspect ratio ultra-wide screen that we reviewed very positively last October (pictured above). The main step forward with this new offering is the mentioned resolution of 5,120 x 1,440 pixels. That’s a major upgrade from the CHG90, which ran with a resolution of 3,840 x 1,080 (as does the Samsung C49J89, another 49-inch model which we’ll have a review for you imminently, so look out for that). Aside from the price – which will always be an issue with these sort of monitors – that resolution was the major downside of the CHG90, because having a giant, lengthy screen, which keeps the same vertical resolution as a standard Full HD display can make things feel a little ‘cramped’, as it were. And the overall pixel density, or detail level, of the CHG90 was really the same as a Full HD monitor, which is why it’s particularly exciting to see this new offering crank things up to 5,120 x 1,440. There’s a bit of take, as well as give here, though, as the new panel has a refresh rate of 120Hz, slightly lower than the CHG90 which hit 144Hz. Although admittedly, the frame rate will be harder to max out given the higher resolution on the new panel. Otherwise, this incoming 49-inch monster from Samsung remains the same as the CHG90, being a VA panel with ultra-thin bezels on three sides (all except the bottom bezel), and sporting an 1800R curvature. Bear in mind that all this assumes the report in question is accurate, of course. This 49-inch monitor will be the flagship model, unsurprisingly, with TFT Central claiming that there will also be a 43.4-inch panel with a 3,840 x 1,200 resolution, using the same frameless design with an 1800R curvature – and a higher refresh rate of 144Hz. That’s also expected to go into production in September. For those not wanting a huge screen, there will also be a more compact 34-inch model planned with a resolution of 3,440 x 1,440, again with a 144Hz refresh rate (this is actually a spin on an existing model, just with a slightly faster refresh rate). Finally, Samsung is set to offer a 31.5-inch curved VA panel with a 3,840 x 2,160 resolution and 120Hz refresh rate. The 34-inch monitor should kick off in production during Q3, but the 31.5-inch effort will be arriving first, with the assembly lines expected to start whirring in July.